Stopping at Pompeii Sorrento and Positano on the Amalfi Coast. 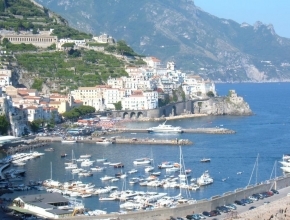 This excursion will take in the breathtaking sights of the Southern coast of Italy. Your driving guide will provide you with lots of information about the history and culture of this stunning landscape. Visit the many cultural sights this area has to offer, including one of the most beautiful cathedrals. route for you to enjoy these truly spectacular photographic oppertunities. Travel to Pompeii, approx 45mins. many questions as you would like. you wish to spend there is entirely up to you. This is an absolutely awesome excursion, with stunning views of Pompeii, Sorrento, and the Bay of Naples. After Pompeii, we will take you down the coast to Sorrento... passing through Massalubrense, "The land of the sirens" made famous by the Legend of Ulysses. With views streching over to the beautiful island of Capri,this breathtaking panarama will have you once again reaching for your cameras! Once in Sorrento,you will have time to visit the historical quarter, or do some shopping. For those who would like to sample the local cuisine, we would reccomend one of the best family kitchens in the area. Ristorante il Panorama. Price will include: tax, penalty,gas,hightway and parkings. Entrance to Pompeii Euro 11.00 Obligatory.